Mrs. E. and I attended a fundraiser for Fetch-a Cure this past weekend. A good friend was being honoured as Pet Philanthropist of the Year and our hosts for the progressive dinner party were our very close friends. It was a fine evening, even if we did miss the trolley that was to take us to the dinner and had to hitch a ride with another gracious couple. That’s the danger of a creative dress code. It leaves us wondering. For the holidays this year, be specific about what you wish your guests to wear. Tell me it’s casual and I will show up in trousers, a shirt and sweater. Semi-formal doesn’t exist anymore and used to mean a business suit. Now we call this business attire and you’re just as likely to see sportcoats and open-necked shirts. I suggest using “coat and tie” or “cocktail attire” which lets the women break out those wonderful cocktail rings and dresses if they’d like. “Festive” or “Holiday” dress may unleash a flood of reds, greens, velvet and satin as we celebrate in different ways. Caveat emptor. 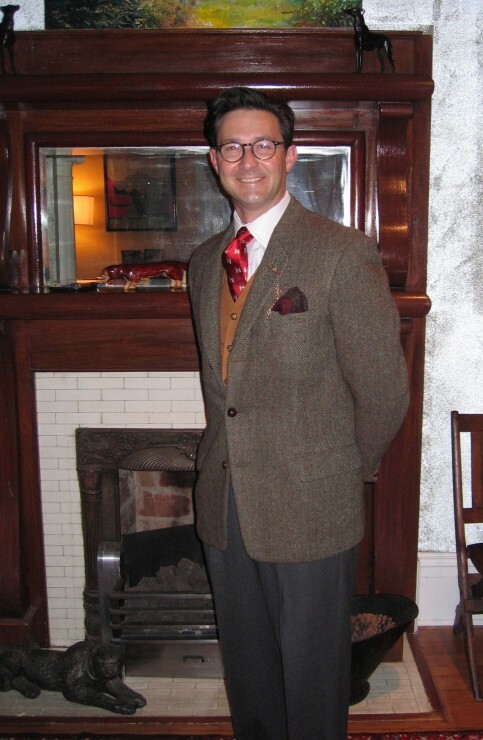 This entry was posted in Elegantology and tagged Dress Codes, Fetch-a-cure, Holiday Dressing. Bookmark the permalink. I couldn’t agree more- ambiguous dress code is asking for trouble. If I am ever unsure I always go for cocktail attire- as I would rather be overdressed than under. Mrs. E’s outfit sounded lovely! I just received an invitation with the dress code Black tie optional to Formal. Unless they are still one of the few people left who think of White Tie as formal and Black Tie as semi-formal (which I doubt) they’re associating Formal with a suit and tie. 1. Did the host(ess) provide enlightenment as to what (s)he originally intended by shaggy chic? 2. What is attached to your lapel? P.S. David V – Do us proud, show ’em what’s what. Make everyone else ashamed they ever rented that teal one-size-fits-all cummerbund. David V. How very odd. I hope you can press a dinner jacket into service! Cap’t, I suspected you might like that look. Shaggy chic was supposed to steer us towards animal prints, etc. as it was a benefit for canine and feline cancer relief. On my lapel you see the chain of a a pocket watch. I had to remove the fob as it identifies the bearer as a high level Mason, which I am not. Like a lot of what I wear, it was inherited and still keep great time. The watch was made in Lancaster, PA.
DC, she looked lovely as always. Thanks! Shaggy Chic suggests that hairy legs might pass . . . I am not a fan of ‘theme’ dressing–our town’s zoo holds an annual fundraiser, and every year women pull out the most awful animal prints . . . on their shoes, their hair bands, dresses, fingernails . . . you get the dreadful picture! Whenever there is a theme event, I intentionally avoid dressing the part. Instead, I wear what would be appropriate for the time of day, venue, etc. Perfect example: Last Spring at our daughter’s school’s annual gala, the theme was something about Paradise. There were literally hundreds of Hawaiian print shirts, men in shorts, and ladies in similar garb. Since it was a Friday night, cocktails, dinner, silent and oral auction, and a high ticket price to attend, I wore a pretty fantastic black-with-white-trim cotton pique dress, multi-strand pearl bracelet, and pumps. I guided my husband to his handsomest Spring weight navy blazer, tie, and grey trousers. A couple we know well who were both dressed in typical tourist “Paradise” garb took a look at us and observed that we opted out of the Paradise theme. The husband’s comment was that they dressed for Miami and we were dressed for Newport Beach. Paula, one man’s paradise… I’m still, to my knowledge, the only person in the latter half of the 20th Century to wear a dinner jacket to the Paradise Island casino. I would have worn an island print tie to your affair. Nantucket Reds would have been the default dress here. Along with a few Aloha shirts, I’m sure.